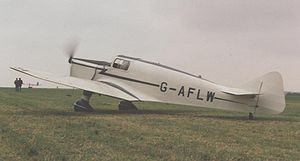 The Miles M.17 Monarch was a British, light, touring aeroplane of the 1930s. It was a single-engine, three-seat, cabin monoplane with a fixed, tailwheel undercarriage. The last civil type produced by Phillips and Powis before the war, the Monarch was a development of their earlier Whitney Straight. Compared to its sibling. the Monarch had an enlarged fuselage, allowing provision of a third seat in part of what had been the luggage space. Eleven aircraft were built between 1938 and 1939, six of these to British customers, the rest going to export. On the outbreak of war five of the British-registered machines were impressed by the Air Ministry; one machine belonging to Rolls-Royce acquired camouflage paint but remained in its owner's service. All but one of these survived the war, though a Dutch-registered aeroplane (PH-ATP) was destroyed in the Luftwaffe raid on Schiphol on 10 May 1940. One aircraft, OY-DIO, was on the Danish register until Sept. 9, 1939 and owned by a Dane named Hagedorn. For the most part, the remaining Monarchs led uneventful but useful careers; a number survived into the Sixties and the last one was grounded for preservation in the mid-Nineties. Brown, Don Lambert. Miles Aircraft Since 1925. London: Putnam & Company Ltd., 1970. ISBN 0-370-00127-3. Miles Monarch Pictures and Miles Monarch for Sale.